As fascinating and outlandish as it would be, bearded dragons (Pogona) don't actually have beards of hair. When they're trying to intimidate others, their throats puff out and take on temporarily darker coloration. Both of these things together indeed make them look like reptiles with prickly beards. 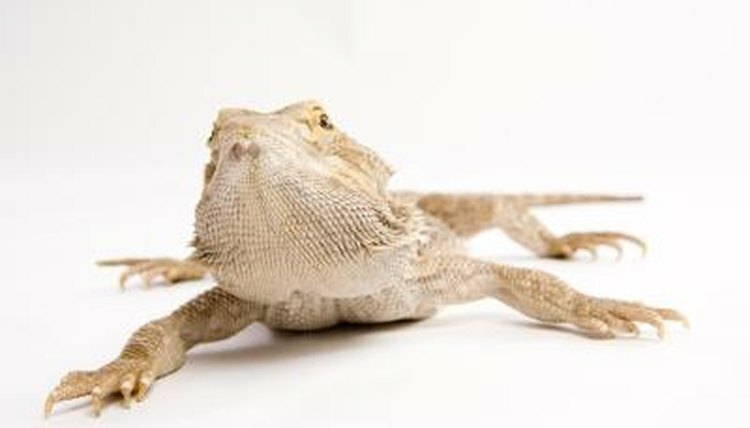 Bearded dragons are equipped with spiny pouches on their throats, right below their necks. They respond to menacing situations by trying to look more imposing to their enemies. They puff out these pouches employing air. As this happens, their pouches take on a temporarily darker tone, close to black. Females' beards are generally paler than those of males. Male bearded dragons do these things not only as a means of coming across as fierce and ready to fight in perilous circumstances but also in times of breeding as a wooing technique. Females also frequently express truculent intentions by puffing out their beards. Bearded dragon puffing isn't limited to their throat areas. They also conspicuously puff out the edges of their physiques in their efforts to fool others into perceiving them as larger than they really are. They even show better posture in these situations, gaining helpful height boosts. Aggression can occurs after a bearded dragon puffs up. Bearded dragon battles can consist of opponents moving repetitively around each other. They keep their mouths ajar as they do so, showing their vivid yellow interiors. These fights involve efforts to nip their enemies' tails and therefore force them to leave what they perceive to be their own personal territories. Furious head nodding also typically accompanies these duels. These fights generally don't result in major harm. It isn't uncommon for male bearded dragons to fight over things like social status and the accompanying access to females for mating. When a male bearded dragon puffs out his throat with a motive of breeding, mating activities often follow. If a female is willing to participate, she might respond by nodding her head, although usually in a much less hurried manner than the male's swift oscillations. During mating, males' beards often become practically jet black, as they do in times of fear and aggression. Females' beards also frequently become darker while mating, but not to the same intense degree. What Does the Betta Mating Dance Look Like? What Is Inside an American Bison's Hump?